Nearly fully shiny-waxed and gibboused moon, so there will be some decent low tides. The weather has been a bit dreich and I haven't been down to the gastrobeach for a few days. But hopefully good tide-ings will entice me out this weekend. I've recently acquired a hachoir. It does a fine job but I find it a bit of a pain to get it out, then clean it up and put it away afterwards, just to chop a few herbs. I'm quite practiced with a big knife for this job and I enjoy reducing a pile of herbs to a delicious and fragrant slurry with my rapid rolling/cutting motion. On the other hand my wife has really taken to the hachoir. 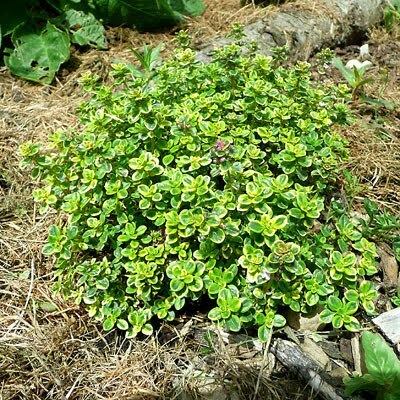 She used it the other night to great effect; rendering an enormous pile of garden-fresh marjoram, lemon thyme (pictured) and parsley down to nanoherb-scale bits. This she piled onto fresh salmon along with olive oil, seasoning and lemon juice. Baked in foil in the oven, then cooled and served with salad and houmous it made an excellent summertime meal. I call the utensil a hachoir but it's also known as a mezzaluna (meaning "half-moon" in Italian). I always thought of the single-bladed one as being a mezzaluna and the double-bladed a hachoir but, apparently, both names are correct. Need to get the grass hachoired soon. The clover is takin' over.